If you read this blog on a regular basis then you may know that I don't consider myself a political sort. Oh, I like politics in a general way, and I have opinions (I have LOTS of opinions, people, LOTS), but I don't consider myself particularly astute when it comes to political issues. I know the general issues but if you want to discuss the fine points of some hot political topic I probably won't be able to contribute much. Despite all that, though, I do have a keen interest in the political world, and for me it's more about the character of those involved in it. I may not be politically astute but I like to think I'm a fairly good judge of character, and thus my thoughts on politicians - and their value - is often based on a certain gut instinct about them. This was certainly true when I attended the PC Leadership Debate that was held here in Fort Mac a few months ago, and at the time I wrote about the two candidates who impressed me most that night. One of those candidates was Alison Redford, who is now, of course, our premier. I had the opportunity this week to hear Alison speak again. I hadn't planned to attend the local Premier's Dinner, as to be honest I thought the tickets prohibitively expensive (and money that I could donate to a local charity as opposed to hear a politician). I recognize it serves as a party fundraiser and that one pays a price to hear our premier at such events - but to me the price seemed a bit high. I was both surprised and delighted, though, when I received a phone call from Donald Scott's assistant (Don Scott is, of course, a RMWB councillor and local lawyer) telling me that he had kindly and generously purchased a table so all the local media could attend - and I was one of those invited. 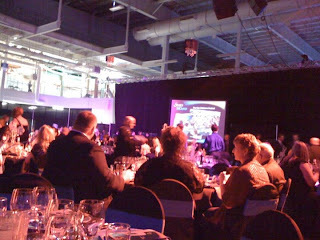 I accepted, of course, and thus I attended the Premier's Dinner at the Sawridge on Thursday night (if you are keeping track that means I ate both lunch and dinner at the Sawridge that day, which makes my renewal of my MacDonald Island gym membership that very same day very opportune indeed). I arrived at the Sawridge a bit early as I knew it was going to be packed. The dinner had sold out, which I think is terrific as it shows our tremendous community interest in government and how it affects us. I got my name tag and began to mingle. Politics isn't my thing, as I've said, and I tend to find myself a bit uncomfortable in that atmosphere (and I always wonder if they realize how I probably lean quite far to the left compared to most people in this province - one doesn't escape a childhood in NDP Saskatchewan and young adulthood in liberal Toronto easily, people). It was nice, though, as I began to run into people I know a bit and I was able to chat and blend in fairly easily. I even chatted very briefly with a couple of the MLA's who had accompanied Alison to the city (and there were several who made the trip, which I think speaks volumes to the importance of Fort Mac in this government). I had met Alison Redford at the leadership debate. I introduced myself to her then, and I was struck by how genuine she seemed. She said something to me that night that I wrote about, and that has stayed with me ever since. She said that when she thinks of Fort McMurray she "gets goosebumps". It seemed to me to be the most sincere and authentic thing any of the candidates said that night, in fact. One of the other candidates had said that he "woke up every day thinking of Fort McMurray" and I must admit I didn't believe it for a heartbeat. But when Alison told me about her goosebumps I could sense her sincerity - and I believed her, too. One of the other things I noticed when I met Alison the first time was how similar we are in some ways. Our gender, of course, but we are contemporaries in age, too. We are both parents of young daughters. And, sadly, we now have even more in common as we both lost our mothers very unexpectedly, mine three years ago and hers only very recently (a pain which must still be so fresh and sting so deep, a pain I know so well and that I wanted to express my sympathy for, but which I also know to be so private and deeply held). So, I saw in Alison a bit of an equal in some ways, although also someone who has done far more in this world than I, and someone to hold up to my daughter as a role model, regardless of the outcome of the leadership race. When Alison won the leadership I was not surprised. I always thought she might be the dark horse candidate, but that she had something genuine and authentic about her that impressed people, as it had impressed me. So, being able to listen to Alison at the Premier's Dinner was a delight. She spoke of many things, of course, but made no grand and sweeping promises. She spoke of her commitment to education, health care, local infrastructure, and resource management. She spoke of Alberta being opportunity, and about Fort McMurray being the "beating heart" of the economy of this province (and people, there is no doubt this is true). She spoke of her commitment to making our province better, and using a thoughtful approach to governance that creates a prosperous and healthy future for all Albertans. She said two things that struck me most, though. She said that we are a visible symbol of the courage to create and imagine a future. And she said this : "Fort McMurray is not just a boom town, it's a home town". People, at that very moment I knew she got it. She understood that we are not just a community of contract workers and drive-by journalists. She understood that we are a community where we raise our families. She got that some day children like my daughter will look back from wherever they end up in this world and refer to Fort McMurray as their "home town". Alison Redford gets it, people. After her speech was over there was a brief and very civil media scrum (I must admit the traditional scrums, with microphones shoved in faces and media types jockeying for position aren't my thing - I'm a writer who doesn't even carry a recording device!). I asked no questions during the scrum, being content instead to listen to our premier answer questions from others and watching her response. What I saw was a woman who is incredibly intelligent and astute, but one who freely admits things she does not know. She answers questions honestly, quickly, and with confidence. What impressed me most, though, is that I think she's a very nice woman but also has a steely determination, the kind of determination you want in the leader of a province that may see some turbulent times ahead. I saw a woman who has been premier for 3 very short weeks but in that time has grasped the leadership. I saw, quite frankly, a premier that made me proud to be Albertan. After the scrum I noted that Alison stopped in the hall outside. Why? To speak to the young boys running the coat check at the Sawridge. I have no doubt this thrilled them, and it impressed me, too. It showed an interest in everyone, not just those of voting age, but in all Albertans. I would also note that later that evening I saw our mayor, Melissa Blake, do the same thing at the coat check, chatting with the boys, and I was struck by the similarities between our mayor and our new premier. They are, both of them, mothers and professionals, and women of vision, passion, drive, courage - and authenticity. They are both women who have earned my respect and admiration. They are both women I hold up to my daughter and say "See? See what you can do and be?". Just before I left for the evening I stood in the line to speak with Alison. Many had brought cameras to have photos taken with the new premier, but I brought no camera. I didn't want a photo, you see. I wanted to congratulate her on her new role as premier, and when my turn finally came, I did. She remembered me from the leadership debate (and even commented that she reads me on Twitter all the time, which pleased me deeply). I told her I was proud to have her as my premier, and that she is a role model for my daughter - and I am, and she is. There was a moment Thursday night I will never forget, people. As I listened to Alison deliver her speech, as I listened to her speak about Fort McMurray, I sensed that odd pricking sensation on my arms. I realized that I was getting goosebumps, much like the ones Alison said she gets when she thinks about our community. I too was getting goosebumps, but not from thinking about Fort Mac. I was getting goosebumps listening to our new premier as I began to realize how much I respect and admire this woman, and as I realized how very much I want her to lead my province into that future she described. 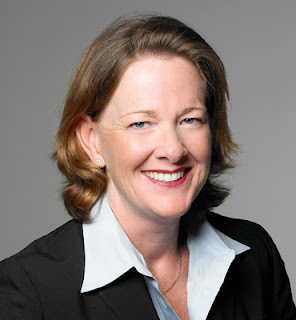 Fort McMurray might give Alison Redford goosebumps, people, but it is Alison herself that gives me those same feelings. I might not know political issues in depth, but I trust my instincts - and those goose bumps told me that our new premier is someone very, very special. They told me that she is, indeed, the premier for the brightest possible future of Alberta. So, in the final analysis, Alison Redford gives me goosebumps, people, and I'm trusting them - and her. I started my day yesterday listening to CBC news with my 12-year old Intrepid Junior Blogger. It was 6 am, and she had called me into her room to hear, as she put it, "this guy screwing his own career". Which guy? Rob Ford, the histrionic-prone and controversial mayor of Toronto. I won't go into the details (you can read them here) but as we listened I had to agree with my daughter that the man had likely taken a flame thrower to his own political life. I then commented to her how lucky we are that our own mayor is of such a different sort entirely - and I had that confirmed to me when I had the opportunity to attend the Chamber of Commerce luncheon at the Sawridge and hear the mayor deliver her 2011 "State of the Region" address. I'd only heard about this address the day before on Twitter. I was intrigued, as I always love hearing Mayor Blake speak, but I was even more interested than usual as so much has happened in the past year - and so much is beginning to happen. I contacted the Chamber of Commerce and spoke to Megan, the lovely office administrator. Not only did the Chamber kindly offer me a spot at the luncheon they also accepted my registration as media (I struggle with this, people, as some days I feel like "media" and other days I feel like a woman with a keyboard, and one who should at times probably have the keyboard taken away from her). I arrived at the Sawridge early (as I had seen the notice that the event would be heavily attended). What I found gathered at my table was a mix of local media and local business owners. I was impressed to see the business owners almost immediately exchange cards and begin talking about life in this community, both business and personal. That is what the Chamber is all about, of course, an opportunity for business owners and the like to network and strengthen their ties in the community. The Chamber also represents businesses in the community and helps them to grow and develop to reach their maximum potential. And, yesterday, the Chamber luncheon played host to the mayor, most of city council, several MLA's, and people like me. I wish everyone who reads this could have been there to hear the State of the Region address. You can read it here, and I suggest you do as it's a wonderful speech about the road map for the future of the RMWB. Listening to Mayor Blake deliver it, though, was a pleasure as while she is always an excellent orator I particularly love it when she interjects into the written speech and ad-libs a bit (perhaps a joke, or a tidbit of news that wasn't in the body of the speech). I'm going to quote some of the speech here, and anything in italics is directly from the mayor's speech, as I believe she should get credit for these words. So, what was the speech about? About the Municipal Development Plan, or MDP. As Mayor Melissa said at the beginning of her speech the MDP is the blueprint for the future. The MDP gives us a strategy and a vision for the future and a balanced future with opportunity for all. If you watched the video I posted yesterday I think that's pretty clear. We are already seeing some of that future, with the opening of the long-awaited and desperately needed new bridge this week. We are going to see some of those projects in the near future, too, like the Continuing Care Centre planned for the former Willow Square complex. But the MDP is not a short term plan - it's a long term plan. Mayor Melissa said that we will look back on August 29th, 2011 as one of the most significant days in our region's history. It is that day we took control of our destiny. You see, that's the day Melissa joined with the provincial government and signed a memorandum of understanding regarding the creation of an urban sub-development region. What does that really mean? It means more land, land for residential, commercial, and industrial development. It means an opportunity to grow in size and not just in population, because our population will likely double in the next two decades. If we see that rate of growth we need to be able to address it - and that, of course, is the fundamental goal of the MDP. Mayor Blake spoke about the need for improvement in transportation, not just for today but for the future. This includes improved roads, rail, and air transport. This means improved transit services. This means, eventually, a bypass route to allow the safe and expedient transportation of goods. This means some day in the future looking into an all-season road to Fort Chipewyan and Fort Fitzgerald (places I admit I have not visited, but would love to see). This means a larger airport, and one designed to handle international travel. Our mayor also spoke about the need to develop economic resiliency in our community. We are heavily reliant on resource development of course, but we need to diversify. 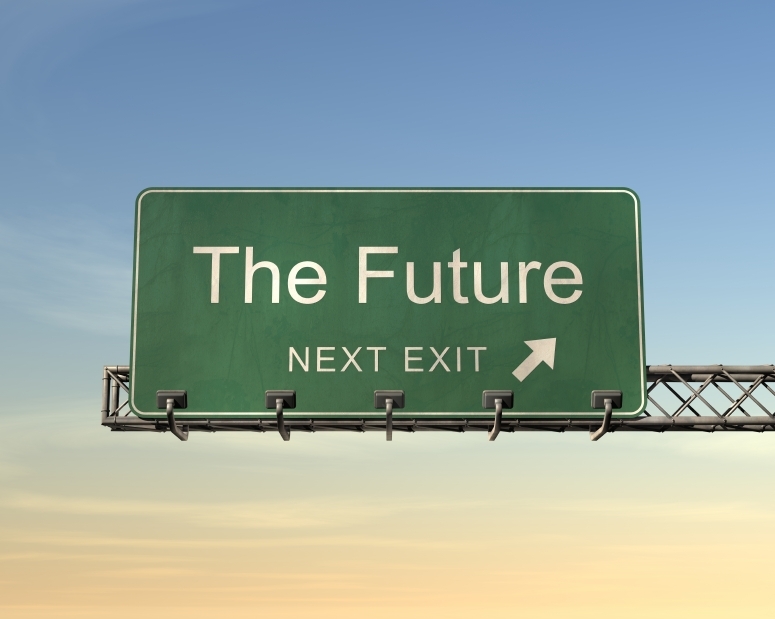 We need to explore other avenues, and to promote a culture of innovation, education, and training. And, close to my heart, she spoke about how a revitalized downtown is key to becoming a smart city. This rings so true to me, and so very important. If the core of a city is rotten and stale it does not take long for that to seep into all areas of a community. On the other hand, though, a vibrant downtown core, one that is a hub for arts, entertainment, and culture also spreads throughout a community. The City Centre Action Plan is a key part of the MDP, and it, coupled with the expansion plans for MacDonald Island, will revitalize not just our downtown but, I think, our entire community. Mayor Melissa spoke about the importance of Keyano College, our public and Catholic schools, and the remarkable openings of three new schools in our region - all within a month. She spoke about our successful bids for the 2015 Western Canada Summer Games, and for the 2013 Canadian Junior Curling Championships. Then we got to the part of the speech that I have circled in my notes. In fact, I put small hearts around it (yes, I know, but I do live with teenage girls, okay?). Why? Because it's the tagline for this blog. It's why I began this blog just over 6 months ago. It's why I devote my time to it, willingly, and without pay. The line? It is about telling our story - because it is a story we must tell - if we don't, others will, and we've seen the result of that in the past. In some ways I think these were the most important words in the State of the Region address. The address was all about telling our own story - about trumpeting our successes, and outlining our plans. It was, in essence, about telling our story - and people, we all have a story to tell of our life here, every single one of us - and we need to share those with the world. Mayor Blake's final words were these : I am proud and humbled to represent you at this exciting time. I am proud and humbled to work with Regional Council to articulate a shared vision. I am proud and humbled to walk with you. We are no longer following others...relying on other people to plan our route. We are now leaders, plotting our own course...and realizing our destiny". Those words have a ring of authenticity and of sincerity. I share them too, as I am so humbled by the chance to spend time with passionate and visionary leaders like Mayor Melissa and our council. I am so humbled by the opportunity to tell my own story of life here, and to share it with the world. I am so very, very proud of Fort Mac, and of our leadership as we achieve our destiny. I am proud of our community, people, and of all of you. I was reminded of this yet again as I sat at a luncheon, surrounded by members of our community, and listened to our mayor tell the story of our community as it is today - and as it will be in the future. to have as my mayor! I've been following the evolution of the Municipal Development Plan, or MDP, for some time. 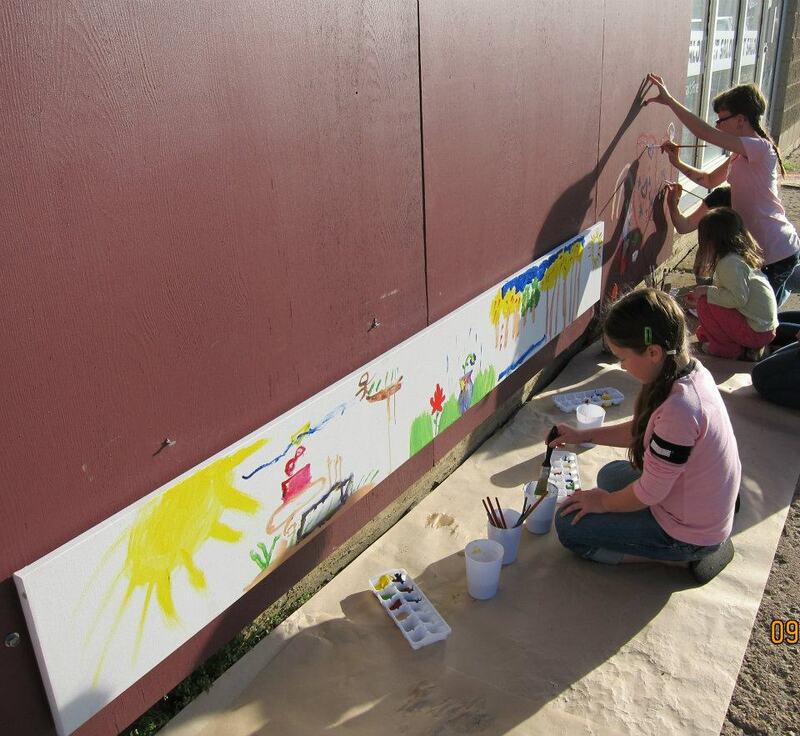 The whole process has intrigued me, especially because it has been built on community engagement. I attended some of the open houses, and was delighted to speak to RMWB staff who were knowledgeable, friendly - and excited about the MDP, too. At the last open house they kindly gave me a memory stick with the entire MDP document on it, and I've read it more than once. I've wanted to write about it, too, but the concept is so large in scale and scope that it was a bit beyond me as to how to fit it into a blog that I try to keep succinct (to avoid readers heading off to their Facebook pages instead). So yesterday I was absolutely thrilled to discover that the RMWB has released a video on YouTube. As they say a picture is worth a thousand words, and this video explains the MDP - in 5 minutes, and in a way that would take me several blog posts to do. Now, people, you're not off the hook. I plan to write more about the MDP, breaking it up into blog-size chunks. This little video, however, can serve as your introduction to the MDP and give you the heads-up as to what is going on in the RMWB in regards to municipal development. Maybe you're wondering why you should spend 5 minutes of your time watching this. Well, if you live here, you owe it to yourself, and your community, to watch. If you happen to be someone who works here but lives elsewhere I still think you should watch because it might just entice you to make the RMWB your new home. And, even if you live elsewhere and don't work here I still encourage you to watch - because just maybe you will see the vision of our community and be as intrigued and excited as I am. Maybe you'll think about coming here to check it out. Maybe you'll even begin to think about making the RMWB a possible home for you, too. Here it is, people - you are all welcome in this community. Come and join us - either for a visit or to stay - and just watch us grow! It seems that every time I interview someone I realize exactly how little I know. Even more than that I learn how complicated everything is, whether it's a business or a charity or a political party. Things that seem on the surface to be simple are far more complex than I have realized - and this occurred to me again when Arianna Johnson, Executive Director of the Fort McMurray Food Bank, kindly gave me some of her time to educate me about the food bank, the complexities of operating it, and running a non-profit organization in general. Arianna is an impressive woman to me, a bit of a force of nature. She took over direction of the FM Food Bank in April, and she faced some significant challenges. The Food Bank had been forced to move from their previous home on very short notice, and it had been a trying time. The transition was beneficial in that they are now leasing-to-own their new home, a larger building in a more accessible location. The space in this building means less food wasted. Why? Because more space allows for easier sorting of food, allowing food with imminent expiry dates to be more easily "pushed" to the front and not left sitting at the back as new food arrives (see, that right there is one thing I hadn't given much thought to - the logistics of expiry dates). One of the other challenges was recruiting a new board of directors. With a new building and a new director the time seemed right to look at a new board. The previous board had done a wonderful job over the past 28 years (yes, that's how long the food bank has been around) but boards need new ideas, too, and with new people comes new ideas. Arianna has some very interesting ideas about forming boards, ideas that I agree with quite completely. Each organization has specific needs, and requires specific skill sets. To have "warm bodies" on a board of directors isn't enough - you need those who bring the skills needed to make your board the most effective board it can be. So, Arianna began to recruit people with those desired skill sets - financial, legal, and, for the food bank, someone who knew food (this turned out to be Chef Clarence from the Sawridge). I've served on boards, people, and school councils. Too often they are formed with people who are definitely interested but who don't have the appropriate skills. I've even been asked to serve as treasurer, when it's quite clear I write because I can't add. This sort of directed board formation makes sense to me. Once again, the inclusion of a chef made perfect sense but was an example of an aspect I hadn't considered - on a food bank board you need someone who understands food (safety, preparation, nutrition, etc). Now, the new building has given the Food Bank much more space, but with that comes increased operating costs, too. This means that one of the things they can use is monetary donations - and not just cash specifically designated for food purchases. I understand why people would donate cash and specify it's just for food, but as Arianna pointed out it takes money to pay the bills, and to pay staff. The Food Bank operates with minimal staff, but if it was entirely volunteer based it would cease to exist (as anyone who has tried to secure volunteers in this city knows). Thus a certain number of paid staff are necessary - but they like to be paid in cash, not canned goods, and so monetary donations that are not designated are very helpful to running the operation. And now about that food. Arianna gave me a tour of the Food Bank warehouse, and it's an impressive space. It's clean and well-organized, and it's very functional. This is where I learned a great deal though - like how much food gets thrown out every year. Why does donated food get tossed? Well, we are back to those expiry dates, people. When groups organize community food drives people often donate "from their cupboard". And if you are like me you are probably guilty of pulling out whatever cans and boxes happen to be there, and you don't check the expiry dates, either. You toss them in a bag, and put them out for pick-up. When they arrive at the Food Bank the dates are checked, it turns out that can of soup expired two years ago, and it ends up in the Food Bank dumpster (a dumpster they have to pay to empty, which means your expired donated food is actually COSTING them money). That's frustrating for the Food Bank, and it means your generousity, while well-meant, has been futile. One of the other things I learned about is the Food Bank's mission to provide healthy food (and food that is culturally appropriate, another aspect that had escaped me). People, I know I am guilty of this : donating macaroni and cheese. Why have I donated this? Because it's sold in a case, it's inexpensive, and kids like it. Unfortunately it also has virtually no nutritional value. As Arianna said it might fill a child's belly but it's not contributing to their nutritional needs - it's fundamentally junk food and inappropriate, especially for children who have little access to truly nutritional food. People, this was a revelation to me. It's not enough to just "donate food" - we need to practice "thoughtful giving". When Arianna took over the Food Bank had an entire wall of macaroni and cheese, more than they could ever use. So, it was distributed to other community groups - and the Food Bank began to try to educate the public on what is really needed by their clients. What is really needed? Well, the list changes weekly, and I will include this week's list at the bottom of this post. There are some standard items, though, that people often don't consider, things like cleaning supplies, personal hygiene items, baby supplies, and feminine hygiene products. The Food Bank has become quite proactive, tweeting weekly needs on Twitter and posting them on Facebook. They also have a great website, and then there is the easiest way to see what they need : call them. They will happily tell you what they need, and this is why they also love to know about food drives BEFORE they happen. They often don't know about these wonderful efforts until after the fact, and while they genuinely appreciate the help they also know it can be much more effective if they have the chance to provide the organizers with a "needed" list. There are ongoing challenges with the Food Bank. Currently they are unable to distribute dairy products as they lack the storage. They have one small fridge, not adequate for their needs if they are to distribute dairy goods. They are using freezers designed for home use instead of commercial ones (home freezers work but are much more prone to short life spans due to the volume of foods they see at the Food Bank). They use monetary donations to purchase meat, but with their storage issues cannot store much at any one time. They are only rarely able to distribute fresh produce (although Dunvegan Gardens often kindly donates excess produce which they happily include in hampers when possible). They issue coupons for eggs. They need a weigh scale that can weigh entire pallets instead of the tiny scale they currently use.They have hundreds of re-usable grocery bags, but they need to be washed. They have a washer and dryer, but need a plumber to come in to install the required plumbing. They dream of walk-in refrigerators and freezers, of being able to do so much more than they currently are able to do. They dream big, and I share that dream, too. One of the other things I learned is that the Food Bank receives no government funding, and has only just begun to apply for grants due to their increased costs. In fact, they are almost entirely dependent on things like the Syncrude Food Drive and the Corporate Challenge (on December 1st, Country 93.3 and Rock 97.9, from 7 am - 7 pm). They are dependent on us, people, which means their clients are dependent on us. And that's the final thing I learned. How many clients? On average they provide 5 clients per day with a hamper. Last year that meant 1,194 food hampers went to homes of those who are hungry. Many of those are families with children. I don't know about you, but that breaks my heart. To see little children go to school hungry is a travesty. To see anyone in our community go hungry is devastating to me. And that's why we have the Food Bank, people. So, to summarize. When donating to the Food Bank ask yourself this : would I feed it to my family? Does it have nutritional value? Does it address their current needs? 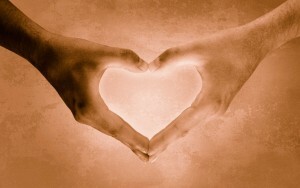 Practice "thoughtful giving", and know that your kindness is having the maximum impact. I genuinely appreciate the time Arianna and her staff gave to me, and I now see myself as a more educated ambassador for our Food Bank. My goal was to pass along this knowledge, and I hope I have been able to do so. People, there is no reason for anyone in this city to go hungry - so join me in the practice of thoughtful giving, and let's see that hunger end. Well, people, I have run into a number of people who, prior to meeting me, aren't sure if I am male or female. In fact I've even encountered a few who said "Oh, you're a woman?!?". Yeah, I'm a woman. Not only am I a woman I am a woman with a weakness for fashion. 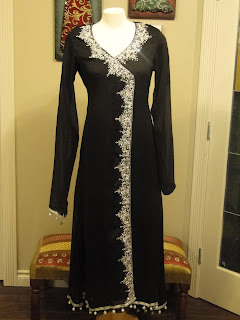 I love nothing more than wonderful fabrics, vibrant colours, and sparkly things (my family nickname is "crow", for this tendency to be attracted to that which glitters). This is how I ended up attending an open house this past weekend at Nisa Collection - and it tapped into every weakness this woman has. 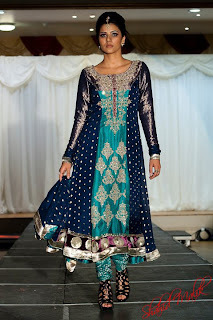 Nisa Collection is run by a lovely woman named Uzma. It is one of my favourite kinds of local businesses, small and cosy, and in fact run from her home. She has set up shop in her basement - and oh, what a shop it is! When we arrived at Uzma's house the Intrepid Junior Bloggers and I were directed into the basement. 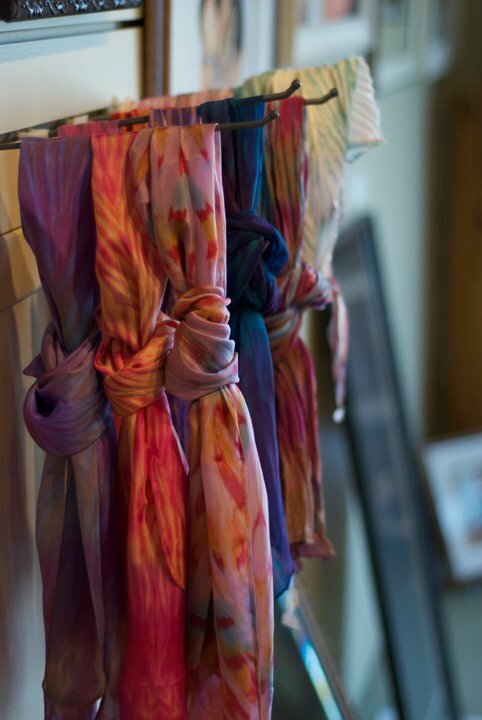 We descended down the stairs and into a world of colour and glitter and luxurious fabrics. 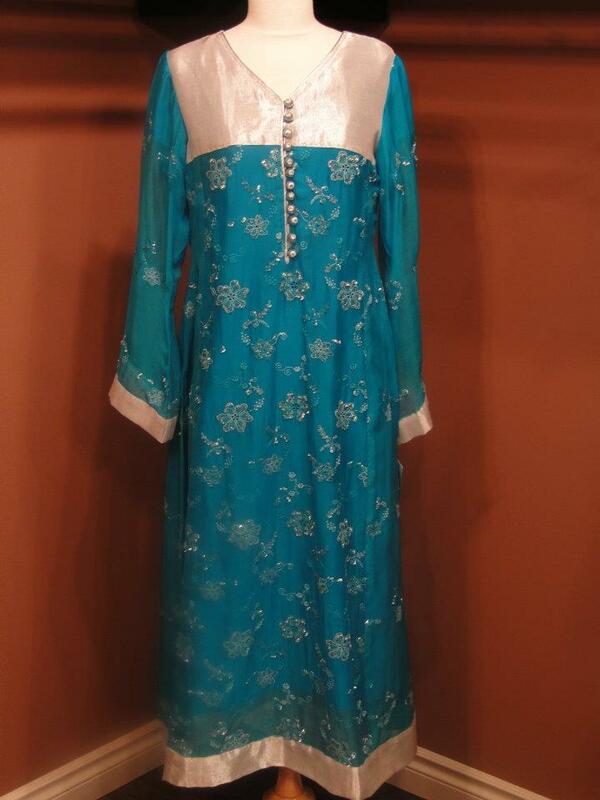 Uzma brings in clothing that has a wonderful Eastern flair, clothing from Pakistan that I have long admired but wondered about for myself. You see, I am a woman, but I am a woman of decidedly European descent. As a friend once said I "make Casper the ghost look tanned". 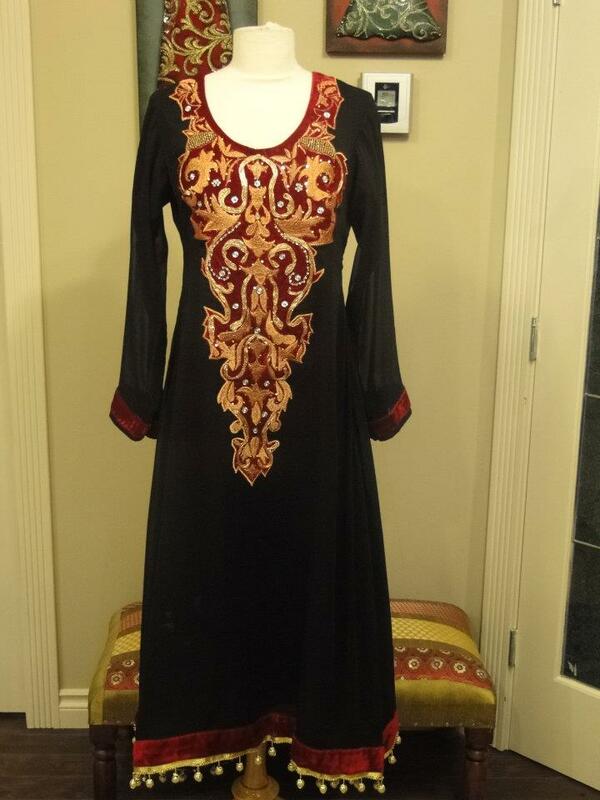 I have always been a bit hesitant about wearing such Eastern-inspired clothing for fear of offending, or it looking like a costume. I realized, though, that I won't hesitate to wear Italian boots, or Peruvian sweaters. I have a tendency towards clothing (particularly shoes) that is unusual and has a dramatic flair, so I am not a coward when it comes to trying new fashion. So, with the encouragement of Uzma, the Intrepid Junior Bloggers, and the other ladies at the open house I selected two garments to try on. When I saw myself in the mirror I was stunned. The clothing is so beautifully cut, and the fabrics feel so good on the skin. 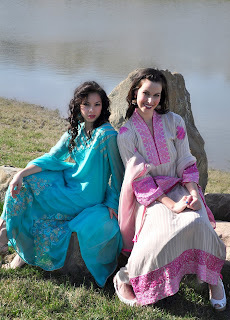 There is a definite ethnic flair to them that cannot be denied, and yet somehow it felt so right, too. I stepped out of the dressing room to great approval all around. No one said the word "costume". No one said the word "offensive". In fact, what I saw were smiles and nods of approval. I tried on two outfits, and settled on the second one (helped in opinion by the Junior Bloggers and the other ladies). I now debate where to wear this outfit, paired with a strappy pair of silver sandals and glittery clutch. 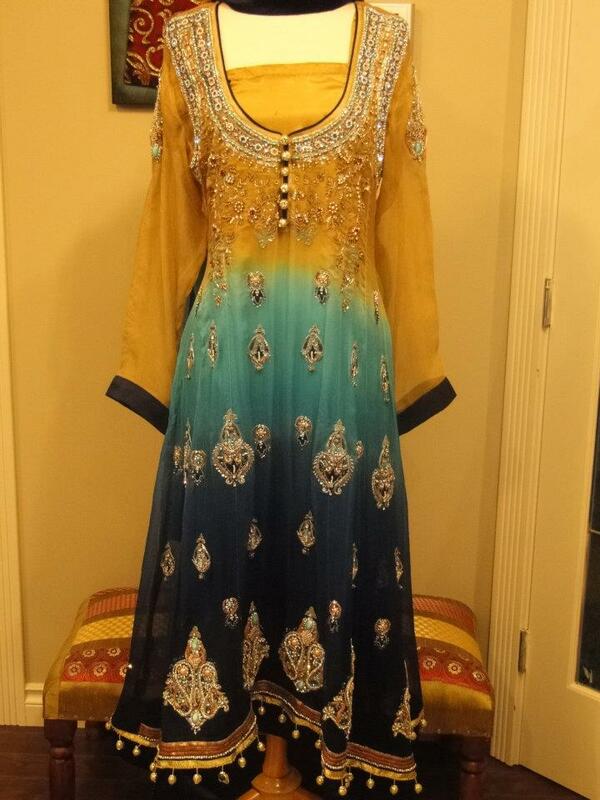 A party, perhaps, or a special event, as the colours and the bling are so party-appropriate. Any hesitancy I had about wearing these items melted away as I realized that what mattered is how I felt in the clothing, and not about whether someone felt it was "appropriate" or not. 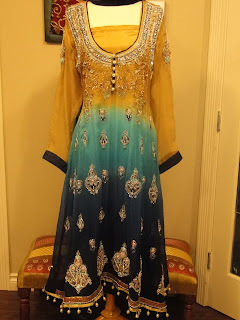 When I paid for the clothing Uzma saw the Junior Bloggers closely studying some of the colourful, glittery bracelets she has for sale. In an act of sheer kindness she told them to each pick out a set and she would give it to them. The girls were delighted as they both have the same weakness for glitter I do, and thus we all left Nisa Collection with new treasures. I know that Uzma's lovely little shop is popular with Eastern-originating women in Fort Mac, but it deserves to be popular with everyone. 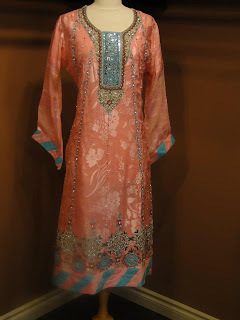 From lovely garments to incredibly colourful shoes, from jewelry to clutches, she has it all - and people, these are styles all women can embrace, regardless of culture. I can't wait to wear my new outfit as it is unusual and different and eye-catching - and I know it will receive comments. Those who think it is inappropriate for this ghost-like woman to wear such things can keep their opinions to themselves - but to everyone else I will say "go to Nisa Collection, just try one on - and see what happens!". This past week I opened the email associated with this blog and discovered a message from MacDonald Island Park. It wasn't just any email, either - it was an invitation. 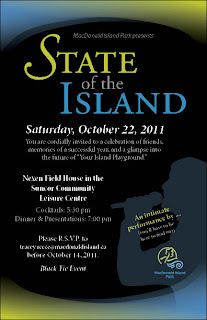 Now, I love invitations and I was very excited to see that I was being asked to attend MI's "State of the Island" gala event. I immediately replied that I would love to come, which is how I found myself at what I affectionately call "my second home" last night. I've written before about spending a lot of time at Mac Island, and it's true. Over the years we have lived here it's become very central to our lives. For years my daughter did figure skating lessons there, which meant I was there 3 times a week. Now that it houses the Total Fitness Centre (my preferred place to attempt physical fitness), the library, the Fox Den restaurant, and the water park I'm there almost daily. This means I am developing a vested interest in the future of Mac Island, and thus being invited to this event meant a great deal to me. You see, "State of the Island" is where Mac Island looks back on the last year, "presses pause" (as COO Tim Reid said last night), and reviews their progress. It's also where the future of Mac Island is showcased, so to be there last night was an honour. I arrived at Mac Island shortly after 5:30, and here is where you will find my only complaint about the night. The line-up to get into the event stretched back to the main doors as they were checking everyone's name on a computer and list and telling them their table number. 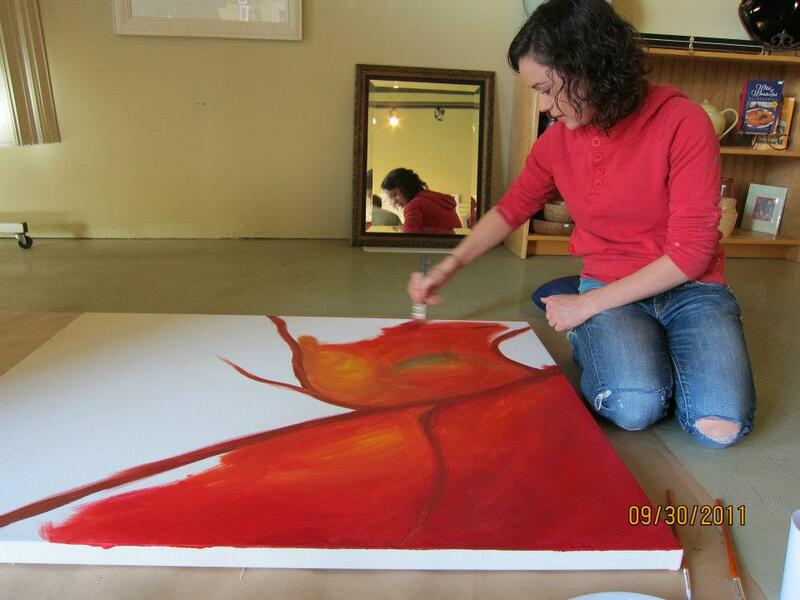 This process was a bit tedious, and for women standing in 4 inch heels a bit excruciating. I think a seating chart with attendants to answer questions might have been the better option considering there were 570 guests waiting to get in, as most people are quite capable of reading a seating chart (and that seems to be standard at most galas). Anyhow, that's a minor quibble and while waiting in line I chatted with some of the new people I've met recently in my city. Upon entry to the gala I found myself in a delightful little cocktail lounge - once again set up in a field house. It's almost like someone waves a magic wand over these places, as what hours before was full of soccer players was now a softly lit bar filled with residents wearing their finest. Mac Island's wonderful and charming Director of Hospitality Naved Noorani handed me a blue cocktail, and my evening was off to a roaring start indeed. I mingled and chatted with various folks, including a couple of the ladies from The Hub, those same ladies who stole my heart when they allowed me to share their table (and their fun) at the recent Harvest of Hope dinner. When we were called in to dinner I found myself seated with a direct view of the stage, and with three other couples. I found myself alone once again at this event, as my husband was away and my best friend unable to come due to illness, but it was not long before I began to chat with the people at my table. Once again I found a variety of stories, people who had been here for decades, and those who had been here for much less. It's one of the things I love about this community, really, and a true joy to just hear others tell me their stories of life here. I must comment on the meal, as I must admit in previous years I have attended banquets at Mac Island that were disappointing. Not so this year, though, as new Executive Chef Jaimeet Kathuria has clearly raised the bar. The food was excellent, with variety galore and quality shining. There was a panko-encrusted eggplant dish that completely captivated me, as I'm not a fan of eggplant and anyone who can make it enjoyable has my appreciation. Later in the evening I had the opportunity to meet Jaimeet and to tell him of my pleasure with the quality of the meal, and I meant every word. I think with him in charge food services at Mac Island will see significant improvement as he brings an entirely new set of standards with him (and he makes a mean vegetable sculpture, too, which apparently he spent hours on when everyone else in this city was sleeping - true dedication, people, to spend that much time on a centrepiece of food that no one will eat). Before and after the meal there were the usual speeches, of course. MLA Guy Boutilier was in attendance, as was our lovely mayor Melissa Blake. Their speeches were short but focused on the importance of Mac Island in our community, and I can't help but agree with them. In my own life Mac Island has become a focal point, and I suspect this is true of many others, too. The chair of the Mac Island board of directors spoke, too, and I was interested to hear from him as I think this board is quite bold and visionary, which are qualities I admire, and which I think we need in this community. The real address I was waiting for, though, was from Tim Reid, someone I have come to know and truly respect, and who I think is responsible for a great deal of Mac Island's success. Tim's "State of the Island" address was terrific. It contained a lot of numbers, like feet of lawn mowed at the golf course, and numbers of dives off the diving boards at the water park. It contained numbers like how many people were members (with 76% of the membership being annual members, which is an astonishing number). It spoke of the significance of the date of October 30, which is when the island closed for renovations in 2007, and opened two years later on the same date (and if anyone recalls those renovations did not come without some degree of pain and frustration). Two numbers truly stood out to me, though. Those numbers? The number 1 - Mac Island being the single largest recreational facility in Canada. I had no idea about that, and I was astonished. The second number? 1.8 million - the number of visits to Mac Island. As Tim said, where did all those people go before Mac Island? What were they doing? That number actually had me speechless for a bit (and people, speechless is NOT a usual state for me). One of the other things Tim mentioned in his speech was heart - and about Mac Island being the heart of our community. And you know what? He's absolutely right. Mac Island is our heart for so many reasons. It is the place we choose to visit to play, and to read. It is the place we go to swim, and to skate. It is the place we choose to golf, and to visit trade shows. More importantly, though, it belongs to all of us. It is a place where we all belong, from sports enthusiasts to readers. 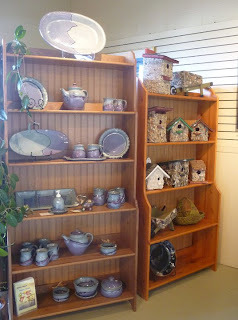 It is a place where the community is embraced and welcomed with initiatives like the community art gallery. It is a place where we can celebrate, dance, enjoy concerts, and ride ferris wheels. It is a place that has become central to the existence of many, from single adults to families. As Tim also said, though, they are not done. They are, in his words, "just warming up". And that is true, too, as Mac Island is on the cusp of an expansion that will see this facility become not just one of the best in Canada but perhaps one of the best anywhere. It will see it become a place of softball and baseball, cricket and outdoor stadium-style concerts. It will see it become a home for many non-profit groups, a place where they can be nurtured and accessed by the community. It will see it become a vital piece of the revitalization of the downtown core, a cause near and dear to my heart as I find those derelict downtowns in other cities deeply saddening. It will see that heart of the community grow and encompass us all. There were so many other things last night, too, like Brian Hatfield, one of the key organizers of my now -beloved "Kids Forever" being honoured for his years of volunteer service to this community. There were announcements of the Oil Sands Trade Show and the Fort McMurray Board of Tourism Trade Shows being signed to deals committing them to Mac Island until 2020. There were announcements of corporate sponsorships and new ventures, like the ATB Financial MI Day, which will see 1500 students attend Mac Island every year to experience the recreation it offers - as part of their curriculum, and free of charge to them. There was so much that it was a bit overwhelming, and so much that there is far too much to share here. After all the speeches were done it was time for the "surprise" musical guest, a well-kept secret although rumours had been flying for days. 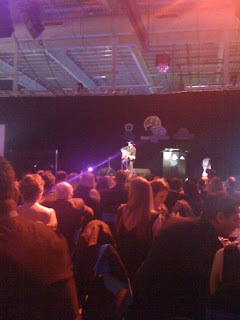 It was a delight to find out it was Albertan Paul Brandt, and he performed an acoustic, solo set of songs. Now, I've said I'm not a country fan, and it's true - but his performance was heart-felt and intimate and lovely, and I was mesmerized by every moment of it. I think all the other non-country fans felt much the same, too. I ended my evening very late, talking with two friends, one I've known for some time and one I've just met. One has been in Fort Mac for decades, and one for mere weeks. I looked at them and was reminded of why I love this community. I went to the gala solo but wasn't alone for very long, and didn't have a second of boredom. I met new people and ran into old friends. 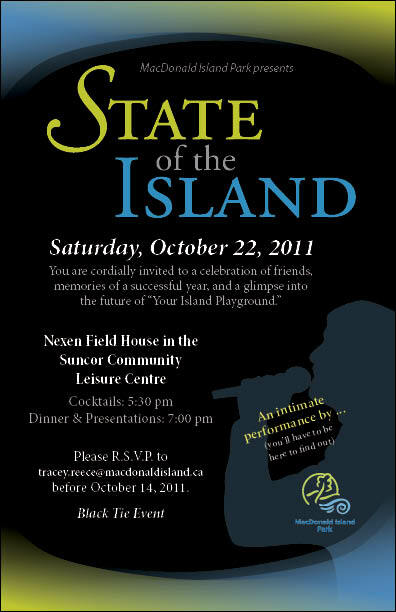 I enjoyed an evening both looking back at the past year for Mac Island, and envisioning the future. I saw the heart of Mac Island, which is not really the building at all but Tim Reid, the MI team, the board of directors - and all of us, people. We, the community of Fort McMurray, are the true heart of Mac Island, and we have just decided to let Mac Island be the place we keep it. 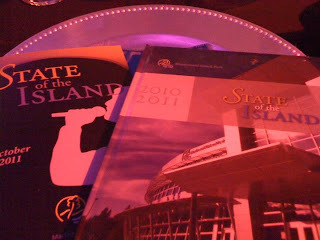 I think our heart is in very good hands, people, and last night's "State of the Island" gala assured me of all that. One of the songs Paul sang last night captured my attention. It is called "Small Towns, Big Dreams", and I couldn't think of anything more fitting for this community, and for MacDonald Island. What started years ago as a dream has become a world-class facility, a legacy to a man named Chuck Knight who probably never could have anticipated what it has become. What began as a small town is becoming a true urban centre where it seems that anything is possible, and where such dreams can come true because there is opportunity and potential and the people to make it happen. I saw that all over again at MacDonald Island last night, people, and all I can is that the state of the island, and of our community, is mighty fine indeed. for inviting me to attend the "State of the Island"
gala. It was a privilege and an honour to attend! Wanna Get Scared? 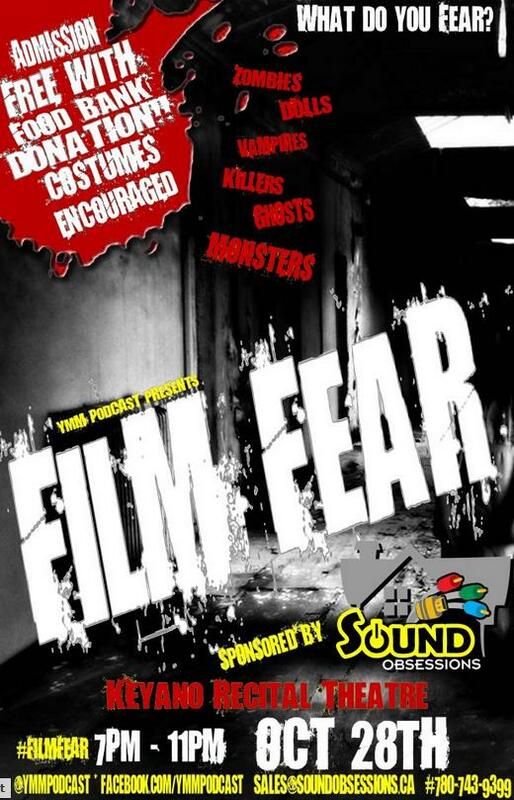 Come To Film Fear, October 28th! When I woke up this morning and saw snow on my lawn I knew two things. The first was that fall is almost done, and winter is announcing it's arrival. The second was that if it was snowing it must mean Halloween is near, since snow and Halloween seem to go together in this city (with the first snow often choosing to arrive on October 31st, making for damp little boys and ghouls). This reminded me, though, of something else - Halloween events in Fort Mac. Every year there are the usual events, like the amazing Chateau Boo hosted by the Boys and Girls Club (happening next weekend out at Dunvegan Gardens, and promising to be a spooktacular event). There is a new event this year, though, and one that I will be attending. Please note, I am attending AND wearing a costume - and people, I haven't worn a costume since I was about eleven. The event? "Film Fear", hosted by YMMPodcast and Sound Obsessions. It's taking place at the Keyano Recital Theatre on Friday, October 28th, at 7 pm. There are a lot of things I like about Film Fear. One is that I have great fondness for Toddske and Tito, the guys from YMMPodcast. We don't always agree (eg, cops on Twitter, a topic Toddske and I have argued at length) but we share a common goal - telling the Fort Mac story. They do it through podcasting, I do it through blogging, and so we are all exploring non-traditional media as a way to transmit our message. I suppose I see them as not only friends but as "brothers in spirit" as we explore this brave new digital world in our own ways. But that isn't my only reason to want to attend Film Fear. Nope, I'm going because I love nothing more than a good party with some good local people, and that is what this event promises to be. Film Fear will showcase two major films, one being "Creepshow", the Stephen King classic, and one being "Red State"by Kevin Smith. I saw Creepshow years ago, and I've long been a fan of Stephen King novels (mostly because the man can make words creepy, which is very difficult). I've never seen Red State but have heard amazing things about it, so I cannot wait to check that out. There will also be a number of independent short horror films shown, and those are the ones I am really eager to see as I am a big fan of independent film making. The guys say there will be costume contests, games, prizes, and other little treats and surprises. There will also be bar service available (after all, what is a Halloween party without some drinks?!? ), and apparently SNAP Wood Buffalo will be there to capture some of the costume finery. So, what does attending this event cost? A donation to the Food Bank. Yes, that's right, just a donation to the Food Bank. I think that's pretty cool, too, as they could easily charge for tickets but instead this is a fun Halloween party with a charitable edge, and one of my favourite charitable groups, too. I knew I was into this whole thing when I went to Spirit Halloween, tried on several costumes, and actually left with one. I don't usually do a costume for Halloween, so this indicates my level of excitement for Film Fear. How I REALLY knew, though, was when my husband, who is rather anti-Halloween, went out on his own and also bought a costume (I was actually a bit stunned, people). I'd told him that this was going to be a really great time with some great films, and, even better, with all the great Fort Mac locals. So, he went out and bought a costume (which shows both his love for his wife, I suspect, and the fact that he can also appreciate the concept of a good Halloween film party). So, October 28th, 7 pm. Put on a costume, grab a donation for the Food Bank, and head down to the Keyano Recital Theatre for some fearful films. Hang out with some amazing Fort Mac people, maybe meet some new ones, and enjoy a new event that I hope will become a yearly Halloween tradition. I will, most definitely, see you there! Please note : Film Fear is an event intended for an adult audience. You know, it seems like I spend an awful lot of time at MacDonald Island these days. I go to the gym there, so that's pretty much a daily visit. Library for new books and great free wi-fi, at least once a week. At least every couple of weeks for lunch at the Fox Den (I love the quiet ambience, looking out over the golf course). And finally I'm finding myself there a lot these days for press conferences. That seems to be an almost weekly event lately too, but I'm not complaining - because with each press conference comes great new things. I attended a press conference at Mac Island yesterday, and the announcement? 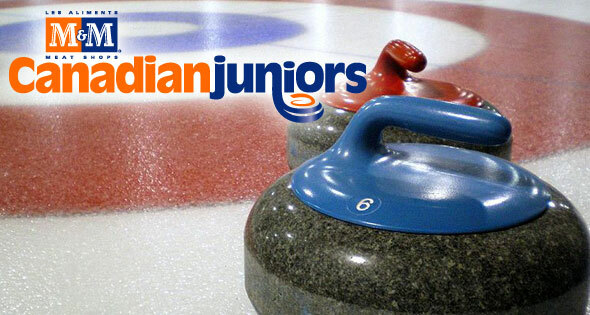 RMWB will be hosting the 2013 M&M Canadian Junior Men's and Women's Curling Championships. This is pretty exciting stuff, people, and exciting for a variety of reasons. Local lawyer and RMWB councillor Don Scott was the bid committee chairman representing our region, and he explained that this entire thing began when Tim Reid, Mac Island Chief Operating Officer, asked him to a meeting in Tim's office. Don said meetings with Tim often involve such ideas, and the hard work that follows (I've made note of this, incidentally, and if Tim ever asks to meet with me I will be intrigued but may just have to be "busy" that day). Fortunately Don was the exact right person to ask, and he took on the task of helping to formulate a bid for the championships. Now, there have been so many of these exciting announcements recently (pro baseball, 2015 Western Canada Summer Games) that I worry that people will begin to think that attracting these events to our community is effortless - it is not. A great deal of work goes into those ventures, and a lot of commitment, too. So, to pursue our chance at these championships a bid committee was formed, our proposal was submitted, and it was, in the end, successful. Now we get to the exciting part. This championship will mean that our community will play host to teams of curlers from across the country. From January 31 - February 10, 2013, 26 teams of young curlers will visit our city. In the past famous curlers such as Kevin Martin, Brad Gushue, and Jennifer Jones have competed in these championships. Our city will be hosting the future greats of the Canadian curling world, of that there is no doubt. But there is more to it than that - our community will be hosting potential ambassadors for our region. You see, in my mind every person who visits this area is a potential ambassador for us. They may come with pre-conceived ideas about who we are, and about what we do - ideas gleaned from the national media. Many of these ideas are negative, and many of them are, quite frankly, misguided. So, every time a new group visits what I see is an opportunity for us to showcase who we really are, to show them our big spirit, and to show them what Fort McMurray means to the people who call it home. So, what I know about curling would fit in a thimble. I was in a curling league once, although it was more of a drinking league where we occasionally curled (and thus it didn't do much for my understanding of the sport, my skills, or my liver). I know that I like curling, I know it's as Canadian as beavers and maple leaves, and I know that there is a passionate following for this sport. And there's the other opportunity, people. Guess who is coming with the championships? TSN, that's who. Yes, we will also be hosting a crew from TSN, who will be covering the championships. This is yet another huge opportunity to showcase our region and to show the entire nation who we are. 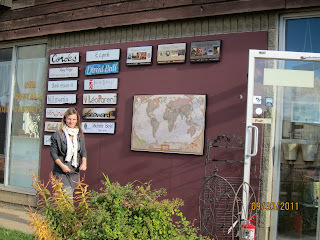 One of the taglines for this blog, and my personal mantra for it, is "telling our own story". I think we, the citizens of Fort McMurray, need to seize every chance to tell our own story to the world. We cannot and should not entrust our story to drive-by journalists and expect them to tell it well or accurately. If we want the world to know who we are then we need to tell our story - and having a crew from a national sports network here is just another opportunity. So, people, we will host a junior curling championship, and we will be able to enjoy some amazing curling. We will see some future curling stars in our city, young people that you may see curling for Canada in the Olympics one day. And, to me, even more importantly we will be hosting 26 curling teams, their families, and an entire nation of TSN watchers. This is a huge opportunity for our community, whether you are a curling fan or not. I'd like to thank Don Scott and the bid committee for making it happen, and Tim Reid and everyone at MacDonald Island for ensuring we have the kind of facility that makes it possible. I know, I've told you all that I'm not a sports fan - but in early 2013 I'm pretty sure you can find me in a local curling rink, watching some fine curling and helping RMWB to tell our own story. I hope you'll join me there, Fort Mac! You know, prior to this year I don't think I've ever been to the opening of a brand new school. I've just never really made it a priority to go, but this year I've been to two - and I had no idea what I've been missing all those years. I've learned that I absolutely love a good school opening - and I was delighted to attend one yesterday, the grand opening and blessing ceremony of Holy Trinity Catholic High School, the latest addition to the Fort Mac Catholic schools (and new treasure in our community). There is an energy in schools that is usually quite palpable, but even more so on special occasions. And there is nothing more special than a grand opening, so the energy yesterday at Holy Trinity was intense. I wandered into the enormous gym and found it packed with students, staff, parents, media, interested community members, and dignitaries. Also in attendance was the bishop for this region as well as several parish priests, members of the Knights of Columbus, and ladies from the Catholic Women's League (a group close to my heart, as my mother was a member until the day she died). The ceremony began with a blessing of the school from both the bishop and a First Nations elder, which is fitting as this is a Catholic school in an area rich with aboriginal culture and heritage. The blessings were lovely and gentle, and reminded me of all the years I spent in the separate school system in Saskatoon. There is a timeless nature to these blessings and these words, and they brought back so many memories of my school years, too. Crosses, donated to the school by Universal Aviation, were carried by students and blessed as well, crosses that will grace the classrooms of Holy Trinity just as crosses were kept in the classrooms I studied in so many years ago. One moment I loved in particular was when Fort McMurray Catholic School Board chair Geraldine Carbery presented principal Lucy Moore with a statue of Saint Patrick, and briefly explained how when Saint Patrick arrived in Ireland he used the shamrock to explain the trinity. 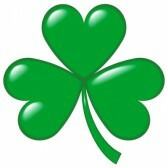 I hadn't really given a lot of thought to the new logo for the school, but of course it is of the trinity, a symbol that has it's origins in the shamrock. This is meaningful for me personally as I recently spent time in Ireland and fell in love with the entire country, and the people who call it home. There were speeches from the usual suspects, of course - the new minister of education, Thomas Lukaszuk, MLA Guy Boutilier, and Mayor Melissa Blake (all wonderful speeches in which they poked a bit of fun at each other, which was charming - I particularly enjoyed when Guy pointed out that while both he and Thomas had been teachers they must have been awful at it since they were forced to go into politics instead). Guy had everyone do the wave, which always excites the kids in the crowd, and yesterday was no exception. Through all the speeches, including the closing speech from Superintendent Kim Jenkins, was the overwhelming sense of pride in this school - and a sense of community, too. This school was designed to be a stellar academic facility, and a shining star in the performing and visual arts, but also to be a part of our community. You can see this in the theatre, available for community use during non-school hours, and you can see this in the way the school welcomes community members into it (people like me, for instance). To close the ceremony local teachers Kimerica and Michael Parr sang a lovely song called "The Prayer". What talent these two have! Beautiful voices singing a song of faith and hope, which was just the right note to end the ceremony. As I left the gymnasium I suppose what struck me most was one thing that I've thought about a lot. Regardless of one's religious beliefs, whether you believe Jesus was the son of God or not, he was in essence a teacher. He taught others of his beliefs, and he showed by example what he wished his followers to learn. He was perhaps the most famous teacher of all, at least in the Christian world, and thus in some sense all these teachers at Holy Trinity now follow in his footsteps. They are in perhaps the most difficult, most rewarding, and most important profession of all. They are the ones helping to shape and form our future - our children. It was an honour to participate in the grand opening and blessing of the school in which they will do so. So, people, I have officially become a new school grand opening junkie. There is something special about these occasions, something exciting and profound, and not just for the staff and students of the school, but for the entire community. There is something hopeful in these ceremonies, something hinting at the future and those who will shape it. 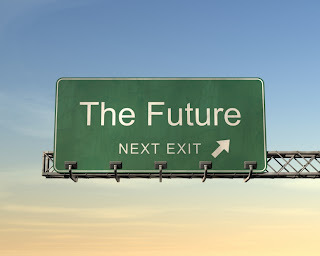 And people, about that future? After the grand opening ceremony at Holy Trinity Catholic High School I am once again quite certain that the future will be, in fact, amazing. I think one of the best things about this community are our hidden treasures. They can be a park or a playground or, in this particular case, a small independent local business. Small businesses are a challenge to operate, as I've noted previously in this blog. They are a challenge even in cities with potential employees pounding at your door, desperate to work for you. They are challenge even in cities with low rent and easily available retail locations. Of course here all those factors work against small business, so finding ones that are successful in both the financial and community sense is a joy. I found this, people, in a business called Frames and More. Frames and More is located downtown on Centennial Drive (very close to Franklin) and even the location is a bit of a surprise as they are surrounded by businesses quite unlike theirs - and yet, they thrive. Why are they unlike their neighbours? Well, they have as neighbours a vet clinic, a grooming salon, and other very service-related businesses. 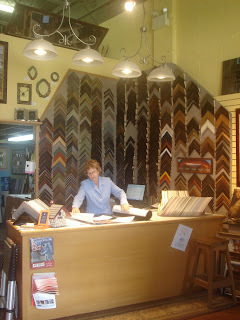 And Frames and More does provide a service, too, as the name implies. It is a framing shop, one of those wonderful places where you can take a treasured work of art, a print, or a photograph and have it professionally framed. I happen to love framing shops as I'm one of those that can linger for hours over choosing a beautiful frame. In the case of Frames and More, though, it is the "more" that is intriguing. You see, the "more" is an art gallery - and an art gallery of the best kind, full of local art. I think I've made it pretty clear in this blog that I am a huge fan and supporter of local artists. The trouble with local artists, though, is that they often struggle to find places to show their works. This is particularly true in a community such as ours where there are few such places to be found, and space is limited. There is the art gallery at MacDonald Island, and it's a terrific spot, but artists truly need a little spot that can showcase a few of their works and just give them some of that local exposure they need. Frames and More is the place, people. When you walk into Frames and More the first thing you notice is that the noise of Franklin seems to recede as you hear softly running water. There is a tranquility here that allows you to check your stress at the door, and this is truly the hallmark of a wonderful place to view art. You cannot fully experience art if you are anxious or distressed or preoccupied, so it is essential to create an ambience that makes the viewing experience peaceful. Frames and More has accomplished this beautifully, and it was mere seconds before I was able to enjoy the art. And the art, people, the art! 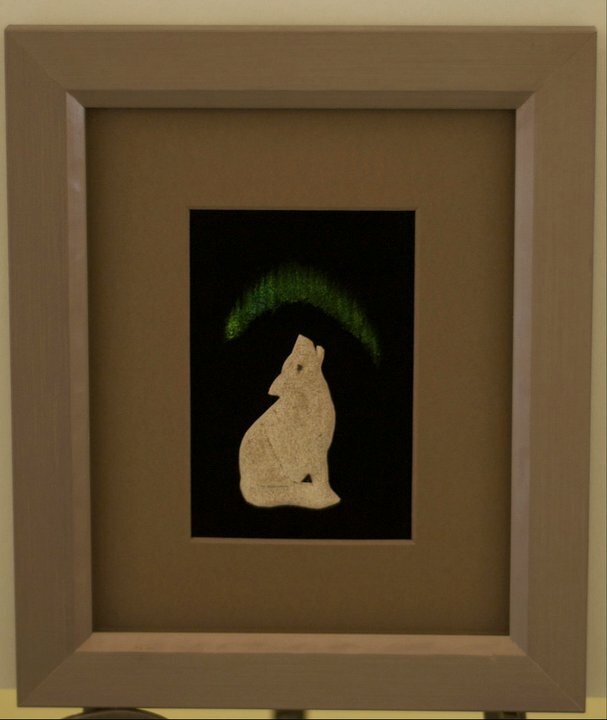 From paintings to jewelry, fibre arts to decorative birdhouses, photography to moose hair tufting(! ), it is all here. There is art by one of my local favourites, Lucas Seaward, who depicts wildlife in the most gorgeous way, every stroke so thoughtful and careful (Lucas is now experimenting with painting with bitumen, a topic I look forward to writing about). There are whimsical pencil sketches, and paintings from local residents, pieces with an ethnic flair that is a nod to their heritage in other countries. There is jewelry that attracts sparkly-minded women like me, and even hand-made soap that smells so glorious you wonder if you should just take a bite of it. And then there are the staff. The shop owner, Florence, is a lovely lady who is clearly committed to the community and to helping local artists to achieve some notice. Her staff are wonderful, friendly and kind, and willing to stop and talk a bit, too. Florence took me around the shop, showing me various pieces and telling me about the individual artists. There is a deeply personal feeling in this store, a sense of pride and joy. There is no doubt that framing is their business but art is their passion, and it spills out onto every wall and available floor surface. 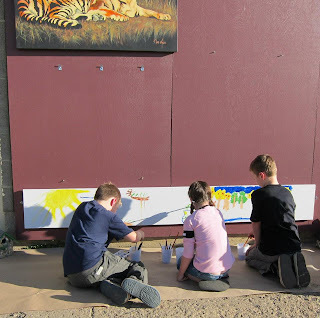 During Alberta Art Days Frames and More decided they would allow community artists to contribute to their community art wall on the storefront. They asked locals - adults or children - to come by and contribute. 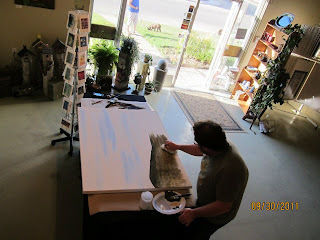 They supplied the paint and brushes, and the artists brought their creativity. People, this to me is art in a community. This is art in motion, art as a way to bind us together. The photos from that day make me smile, to see these local residents contributing to this little local business in this fashion. So, people, here it is. 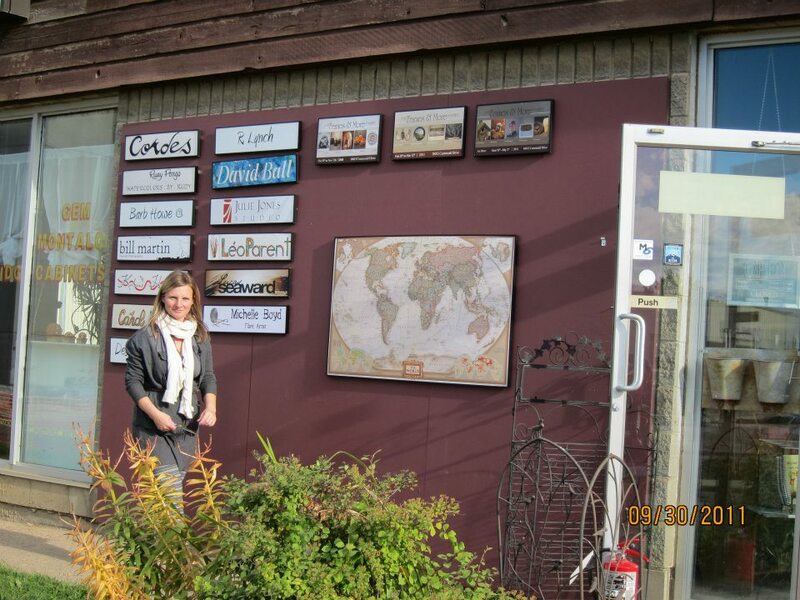 If you want to seek out one of Fort Mac's hidden treasures, head over to Frames and More. Maybe take a print in to be framed (if you are like me you have several stuffed away somewhere). Or, maybe, just wander in to check out the community art wall, or the local art on display. When I went last time I left with a beautiful new scarf, hand spun and knitted by local fibre artist Michelle Boyd, and two bars of handmade soap, one of which now fills my bathroom with the scent of licorice. 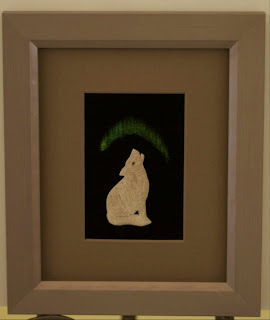 I suspect next time I may leave with a piece of jewelry, or even the small painting that I have been keeping my eye on. Maybe you will leave with a new piece of art, too, or a framed print. Or, maybe, you will leave with a renewed sense of peace and tranquility, an appreciation for some local artists - and a sense that you have discovered a gem in our community. To me, that is truly priceless. See ya there, Fort Mac! individuals are asked to visit the store or call 780-790-1777 to inquire. Well, people, I've mentioned before that I'm not a sports fan, and I haven't been booted out of the city yet, so I'm feeling slightly more comfortable admitting it. However, I know that sports are a huge part of the lives of many, particularly in our community. While I may not be a fan I do see the significant impact sports can have on community building and community development, so I try to keep an eye on the happenings in the local sports world. Last week I attended a press conference about one of these happenings, and people - it's major. It's "major" as in professional quality baseball in Fort Mac. That's about as major as it gets in terms of new sporting opportunities. What I actually know about baseball could fit in a teacup, but I've been to baseball games. I've seen major league games in Toronto, and once a long time ago even attended an international minor league baseball tournament in Saskatchewan. I discovered that what baseball has is passionate fans, and a lot of entertaining moments. I also discovered ball park hot dogs, but that's a total aside and not really relevant to anyone but me and my elliptical machine. So, professional baseball in our community. The timing is, of course, ideal. MacDonald Island is on the verge of beginning an expansion which will include a massive new baseball/softball stadium. We are continuing to experience rapid population growth, much of it families. And, let's be quite brutally honest - recreation opportunities abound, but the chance to see live professional sports is a bit lacking. A professional baseball team would bring terrific family entertainment, use that stadium, provide that opportunity to see pro sports - and maybe even include ball park hot dogs (okay, I'm a bit stuck on that point, I admit it - I miss those!). There are also the spin-off benefits, too. A pro baseball team may attract visitors from other areas to see games, visitors that will stay in our hotels and eat in our restaurants. And I know that when I went to baseball games there was often a restaurant dinner before and a pub visit after, meaning even the locals are likely to pump up those businesses during baseball season. The biggest thing I can see, though, is an incredible opportunity for the youth of our region to see pro sports, find some new role models who are right in our community, and, for some, perhaps even a sport to aspire to excellence in. The league for which the operating rights have been granted is the North American League, which attracts both players that are just below major league level and those who have played in the major league. Many players in the NAL move on to the major league, so this is quite certainly high-calibre baseball. This potential professional baseball team in Fort Mac has a lot of support, particularly from minor baseball in the community. I think, though, that it has significant potential for all residents. How amazing would it be to spend a Friday evening downtown having supper, and then heading out to a ball game? How amazing would it be if it was your kid who caught the ball that popped into the stands? How thrilling would it be to not have to drive down the 63 to see some great sports action? People, I think it would be phenomenal. I think it brings another dimension to the community, and great opportunities for the entire region. If you've ever seen the movie "Field of Dreams" you may remember the line "if you build it he will come". I think we have a chance here, people. I think if we build it, they will come. I think professional baseball players will come, and adults, and children, and with them will come dreams of pennants and championships, and summer evenings spent at the ball game - and maybe, just maybe, if I'm very, very lucky, ball park hot dogs. 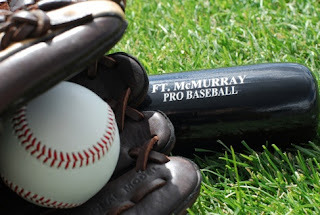 Fort McMurray Professional Baseball is looking for YOUR comments and thoughts on the pro team coming to our city. You can find them at Fort McMurray Professional Baseball. As I've noted before there is no shortage of fundraising galas and banquets in our community. It seems the gala and banquet season is in full swing in Fort Mac, and every year there are the usual events - Keyano Gala, Festival of Trees, and the like. One that I hadn't really heard much about is one I attended just last night - and people, I'm still a bit overwhelmed by the experience. The charity it raises money for has been around for 14 years, but as I commented to someone last night it might just be the best kept secret charitable organization in town - Kids Forever. Kids Forever started 14 years ago, founded by local resident John Foy. The group had very modest beginnings, too, starting operations in the basement of John's house. The first banquet 14 years ago apparently attracted 35 people. Last night the Sawridge saw over 700 enthusiastic, engaged, and involved attendees. The growth over those 14 years has been exponential, and for good reason - Kids Forever is a charity of the very best kind. John founded the charity to assist families with children that were experiencing a medical crisis. This could mean a child diagnosed with cancer, or one born with a disability. It could mean an infant or a teenager. It was designed to help with all those costs that our provincial medical plan doesn't cover - travel expenses, hotels, and meals. It was designed to help families to mitigate the devastation that a serious medical diagnosis creates. The founder felt that these families had enough to contend with in the emotional sense, and shouldn't have to deal with all the financial worries as well. So, he founded Kids Forever - and in 14 years Kids Forever has helped 164 families. One of the first things I noticed at the banquet last night was all the men in red shirts. They were selling tickets, showing people where their tables were located, and just generally running the show. What impressed me most, though, was that the founder of the charity was not wearing a suit and schmoozing with the crowd. No, he was there in a red shirt, toiling away just like all the others. This was my first inkling that there was a humility and sincerity here that was genuine. People have different motivations for philanthropy. Some do it because it raises their public image, and some do it for adulation. Some, though, just do it because in their hearts they believe it is the right thing to do - and it's pretty clear that the Kids Forever gang fall into this last category, the category I reserve for true community heroes. I noticed several other things at the banquet, too. The crowd ranged in age from elderly to very small children. They were dressed in everything from ballgowns to jeans. There were lawyers and realtors, welders and labourers. This was a wide cross-section of our community, not one specific group. There was something very interesting going on here, and I could tell that almost instantly. It wasn't until the presentations began that I realized how interesting, though - or how very profound. The program brochure for the evening showcased the twelve children that Kids Forever helped in 2011. What I learned, though, is that usually these families don't go seeking Kids Forever. Instead Kids Forever somehow finds them, through the local grapevine. They hear about a family in distress and they show up, asking how they can help. I find that not only astonishing but amazing. It's like that true sense of old-style communities, where a family would experience a crisis and neighbours would suddenly appear with casseroles and start doing the dishes. Kids Forever has that feel to it, a sense of that community that doesn't need to be sought out or chased after - they are the neighbours who come to you. The stories of the twelve children in the brochure tore at my heart. Even more compelling was the story told to us last night by a young woman who has been battling cancer for the last 14 months. She is an incredible young woman, someone who despite her medical crisis managed to graduate from high school this year with a 90% average. This despite 14 months in and out of hospital, despite treatments and surgeries that are reflected in her "journey beads" (beads that are collected and strung, each bead representing a treatment, needle poke, lab test, or surgery). The length of her journey beads? Over 10 feet, people. I gasped a bit when she revealed that, and I cried when I realized what this young woman, so much younger than me, has already had to face in her life. Her courage in both her journey and her ability to tell us her own story was profound and beautiful, and she spoke of her gratitude to Kids Forever for all they had done for her, from helping her family with general costs to helping with the costs for wigs to cover that precious, beautiful head of hers. I battled tears the entire time she spoke, and found what she said deep and profound, and a true depiction of the people that are helped by Kids Forever. I dried my tears, and then it was time for the live auction. Ross Jacobs, local auctioneer and crazy guy, burnt up the floor. He cajoled and teased, he created rivalries and joked. Best line of the night? When someone was hesitant about upping their bid to $4600 and Ross said "You can find that in your couch, sir, this is Fort McMurray!". I nearly died laughing at that - and the bid, of course, was increased. The live auction raised over $77,000, and there is no doubt in my mind that the auctioneer was a significant component of that success. The roller coaster ride wasn't over though. After the live auction there were more presentations, and then a young couple came up to take the floor. When they began to tell their story, the young woman serving as the orator, I knew tears would come swiftly and hard. You see, they had been expecting a baby, and during an ultrasound an abnormality had been found. Further testing revealed the severity of the abnormality, and words like "incompatible with life" had been said to them. Just listening to their story devastated me, as when I was pregnant with my daughter I too had an ultrasound that showed troubling images. I too went for further testing, and I recall so well my terror and pain and just plain fear. In my case, though, the extra testing showed all the worry was for nothing, and my daughter was born healthy and sound. I so wish this had been the case for the young couple last night, but sadly this was not to be. They instead endured the tragedy of a baby born with such severe issues that he lived for only 2 hours and 49 minutes. I imagine those were likely the best, and the worst, 2 hours and 49 minutes of their lives. As the young woman shared her story I wept when I realized how it could have been me, and it could have been my child. When she finished her story I glanced around the room and saw everyone wiping their eyes, not just the women but the men, too. I think we all had the same sense. It could have been any one of us, too. People, there was so much more, so many moments of tears and laughter. There were cheques presented to hospitals, and there were families grieving the loss of beloved children. Through it all, though, shone the dedication, commitment, and generousity of this quiet little charity. I'd tried to do research on Kids Forever before the banquet, and found very little. Many people told me of how much they raised every year, and all the good work they did, but they seemed to do it so quietly and so gently that it escaped the notice of many in our community. When I mentioned this to both John and Brian Hatfield (a long time member of the group and one who has had a significant impact on it) they had very similar responses - they didn't try to attract a lot of attention. They didn't go out of their way to court the big corporations or companies. In the same way that they find those in need it seems the local businesses seek out Kids Forever, like the tire company that came to them yesterday with four tires and rims and donated them completely free of charge for the silent auction. The tire company had just heard about the event, and wanted to help out. And there, people, is the true beauty of Kids Forever. It is that old-style sense of neighbours, that sense of community - and that humility and dignity. I could go on and on about the banquet, about Kids Forever, about the children and families it helps, and about my feelings regarding the experience. Instead, though, I will tell you this. There are moments in your life when you witness something amazing, when something catches your heart and you know it will never let it go. That happened to me last night when I fell completely in love with a humble, dignified, compassionate group of men in red shirts. That happened last night when I saw a community open not just their wallets but their hearts. That happened when I heard stories of pain and grief and suffering - and survival. That happened when I looked around a room of 700 people and saw not strangers but neighbours. That happened when I drove home in my car and alternately laughed a bit at Ross Jacobs and then shed a tear when I thought of the courage I'd seen. That happened when I learned about a humble little local charity that began in a basement 14 years ago, but that has become an incredible example of what people can do when they care, what they can do when they do what they think is right, and, what they can do when they do what needs to be done. That happened, people, when I discovered Kids Forever. They captured my heart last night, and they have it forever.